How Fast Is OS X 10.5.7? On Wednesday, Apple released the OS 10.5.7 Leopard Update. The Mac OS X 10.5.7 Update is recommended for all prior versions of Mac OS X Leopard, and according to Apple includes includes general operating system fixes that enhance the stability, compatibility, and security of your Mac. To update to Mac OS X 10.5.7, you have the option of using Software Update or a standalone installer - the latter being my recommendation. The standalone installer is available in incremental "Delta" version, which lets you update from Mac OS X 10.5.6 to 10.5.7, and a comprehensive "Combo" version that lets you update from any prior version of 10.5.x to 10.5.7. I recommend using the combo updater even if you're only moving up one notch from 10.5.6 to 10.5.7 if practical. Note that the Combo updaters are now too large to burn to a CD (well, you might squeeze the client version on - I haven't tried it) and will require DVD media if you want to make a backup or transfer copy. Download the update installer and run it manually. This is also a useful option when you need to update multiple computers but only want to download the update once. These versions of the standalone installers are available from Apple Support Downloads. The Mac OS X 10.5.7 delta update (442 MB) lets you update from Mac OS X 10.5.6 to 10.5.7. The Mac OS X 10.5.7 Combo Update (729 MB) lets you update from Mac OS X 10.5, 10.5.1, 10.5.2, 10.5.3,10.5.4, 10.5.5, or 10.5.6 to 10.5.7. Incremental and Combo Mac OS X Server 10.5.7 updaters have also been posted. Improves reliability when synching contacts with Yahoo!. Includes several improvements to Directory Service and Client Management. Improves overall reliability with CalDav. Improves reliability when automatically synching with MobileMe. Addresses reliability and sync issues with Notes. Addresses an issue that may cause the BCC field to populate incorrectly when redirecting a message from the Sent mailbox. Improves consistency with Parental Controls and application restrictions. Addresses an issue in which time limits may not work properly with full-screen games and Fast User Switching. Resolves an issue that may cause certain third-party printers to print to the incorrect paper tray. Non-admin user accounts can now be allowed to add and remove printers by enabling Parental Controls and selecting "Can administer printers". Includes other printing reliability and stability improvements. I'm certain there far is more than that, and I'm hoping for some more general refinement as well. This update is recommended for all Safari users and includes the latest security updates. Macworld's Rob Griffiths has posted an analysis of what's under the hood in Apple's Mac OS X 10.5.7 Update, noting that there is nothing visually different in this build and Apple affirms only a few changes that may be noticeable at a glance such as more RAW image support, better video playback and cursor movement on recent Nvidia-powered Macs, and the ability to grant non-admin users to add and remove printers via the Parental Controls System Preferences panel. 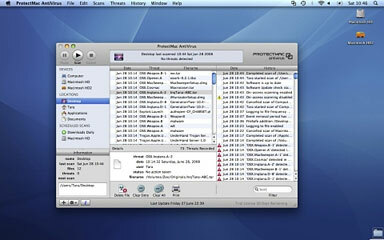 Most of the changes, he reports, are beneath the GUI's surface, and to suss out what Apple has modified, Griffiths dug into the update's BOM file, to discover that the list of programs touched by this updater is huge, but very little of this is mentioned in Apple's 10.5.7 notes page, with only Dashboard, Time Machine, iCal, and Mail directly referenced. Griffiths says he's been tracking OS X updates for quite a while, and this one is among the largest ever, with 16,915 changed files on his MacBook Pro. Macs Only! 's Bill Fox has posted a commentary and some benchmarking on the OS X 10.5.7 update. Bill says he always recommends using the standalone combo updater, and reports that he had no problem installing Mac OS X 10.5.7, including the Server edition, on his Macs: MacBook Air, Mac Pro, PowerMac G4 Cube, iMac Core 2 Duo and PowerBook G4, then to find out if there are any performance improvements, ran a graphics-related subset of my speed tests on his dual quad-core 2.8 GHz Mac Pro with 6 GB of RAM running Mac OS X 10.5.7. User Interface: 189% faster - wow! Link: Mac OS X 10.5.7 - How Fast Is It? Ted Landau and the MacFixIt Staff have posted an updated tutorial on screen sharing with OS X 10.5 Leopard, getting down to the nitty-gritty of how screen sharing works, how it sometimes doesn't work, and when it may even pose a significant security risk. "Using Mac OS X 10.5.6 Leopard users with Internet access can share their connection via AirPort to other users that may not be able to connect. A common example is when your work computer is tethered via ethernet and a WiFi signal does not exist for your laptop. Simple steps are explained to create a personal AirPort signal to connect to the Internet." 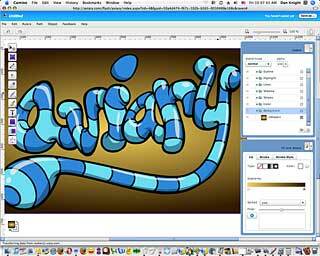 Aviary should look familiar to Photoshop users. Technology Review's Kate Greene reports on an advanced Web-based editing tool is connecting to sites across the Internet called Aviary offering digital artists an online image-editing tool with features that could normally only be found in expensive software, and has now released software that lets anyone integrate these tools into their website. Chris Latko's Shiretoko 3.5b5pre optimized build of Firefox 3.5 beta is now available, some new numbers and a slightly updated FAQ. Chris says he's been using WebKit, Minefield, and increasingly Opera as his main browsers for a while now (and Bon Echo (Firefox 2)) and has recently been running Shiretoko (Firefox 3.1) to take advantage of TraceMonkey. But he's been longing for an Intel optimized build and hadn't found one, so he made one. Chris has also made a few adjustments to the default config, namely turning on TraceMonkey and other minor tweaks to eek some additional speed out. Whatever he did, I've been using it, and it works! Internet News' Michelle Megna reports that in ForeSee Results' latest e-commerce satisfaction study, Apple dropped five points to trail both HPShopping.com and Dell.com, while Newegg.com and TigerDirect.com led the computers and electronics category with the highest online customer satisfaction scores. "Last year we provided benchmarks looking at Ubuntu versus Mac OS X when it came to using the latest releases for both software platforms at the time. Both operating systems had performed competitively - in some tests, the Apple OS wound up on top while in other areas Canonical had the advantage. Since that article back in November, Apple has released a minor update to Leopard (v10.5.6) and Canonical last month released Ubuntu 9.04. We have already looked at the performance of Ubuntu's Jaunty Jackalope, and even found it to perform with old hardware, but how does it now compete with Mac OS X? We have more benchmarks this morning to continue this performance investigation." Summary: OS X wins most comparisons, but Ubuntu has a real edge with Java. PR: My computer won't wake from sleep; what do I do? I just spilled beer on my keyboard. My Mac froze up; now what? My computer was just repaired, and now I can't play the stuff I purchased on iTunes. What back-up strategy should I choose? Mac users now have a free, easy-access resource to help them resolve scores of these kinds of questions and situations - with the publication this week of the Ninth Edition of the "Tekserve Mac FAQ," a clearly written, 58-page pocket book. 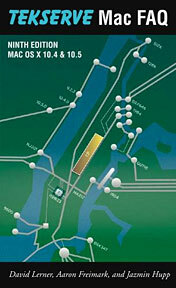 It's available free at Tekserve, the premiere New York City Apple reseller and service provider. Those who can't make it to Tekserve (119 West 23rd Street in Manhattan) can find the content at www.tekserve.com/faq or order the pocket version (for $4.95 shipping and handling) by calling 212-381-6300. Said David Lerner, Chief Executive Officer and Cofounder of Tekserve, "We published the first 'Tekserve Mac FAQ' in 1998. Since then, technology has changed, but our commitment to Mac users and to helping them keep their Macs running smoothly and trouble-free hasn't." Handle crashes, freezes and kernel panics: Frozen mouse? Keyboard not working properly? Is the screen getting all wonky with messages in English, German, French and Japanese? Deal with computer slowdowns: Have iTunes tracks stopped working? Perhaps a DVD has gotten stuck in a laptop? Does the operating system start at a snail's pace? Back up data with or without Time Machine: All hard drives are prone to failure. The book walks users through setting up a back-up plan, whether it's with Apple's Time Machine, an external hard drive, or with a stack of DVDs. Avoid spam, viruses and other bad stuff: Although less common than PCs, Mac OS X is vulnerable to viruses and worms, and it's smart to take the appropriate precautions. The "Tekserve Mac FAQ" also shows users how to set up a spam filter. Share files with Windows PCs: Whether one must run Windows on a Mac or maybe just be able to easily share files and printers with PCs in a network, the book guides users through a flawless setup. Get the most out of an iPod/iPhone: The guide teaches users how to maximize battery power, use the iPod as an external hard drive and more. Tekserve is New York's largest independent Apple store and service facility. Tekserve has been servicing the local New York City community for over 20 years offering Mac sales, service and repair, iPods and accessories, Mac accessories, pro audio and video solutions, rentals, on-site service, and data recovery. PR: ViBook, a new USB-DVI graphic cable from VillageTronic, allows you to connect simultaneously up to 6 screens to your computer, whether PCs or Intel-based Macs, portable or home computers. 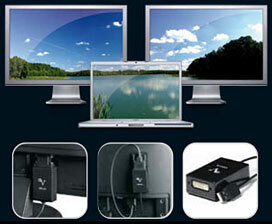 ViBook cable is suitable for all kinds of projectors or screens - both digital and analog. It offers you a new way to work by taking advantage of having 6 monitors connected at the same time. ViBook offers you the possibility to connect and manage all different screens, increasing your working area on which you can organize different documents and programs. Thanks to its small size, you can easily connect or fix ViBook directly to the monitor. In this way you can save space and eliminate annoying cables; your working area will be tidy and without obstacles. With ViBook you can read your emails, support a video conference, work on a Excel document and check your profile on Facebook, all at the same time. Simply connect different monitors with one or more ViBook and you can concentrate on your projects without effort. With the USB-DVI graphic cable ViBook you decide what to do and when to do it. You can save time and optimize your productivity. ViBook is also useful for people that want to manage at the same time mails, documents or connecting programs at home. ViBook offers you the possibility to connect different "videos" to your computer, allowing you to work on different activities simultaneously with satisfaction. You don't need to be a software developer, a student, an operator of the financial sector nor a creative person, with ViBook you can always manage your tasks in the best way, optimizing your time, your works, and the space on the working area. Thanks to its ergonomic design and small dimension, you can choose to connect ViBook directly to the display, by using a small supplied adapter, or fix it to the monitor through a fastening bracket positioned on the back of the screen, with screws (VESA) or double-sided tape, supplied in the packaging. The ViBook cable, connected through USB, has a higher compatibility compared to the other devices sold on the market. Its internal structure, in fact, develops a maximum consumption of 450 milliamps, for this reason it complies with USB specifications, unlike other solutions that require a bulky mains adapter plug. This characteristic, both with the heat sink, ensures a lower operational temperature and, consequently, a lower energy consumption and a longer life of the product. Also for this reason, ViBook has a 3 years warranty. Support for sleep or suspension mode. Specific software driver for business installations. Besides ViBook, you have a large range of accessories created to simplify your life and to give you a better solution in every moment. Adapter for direct connection to the screen. 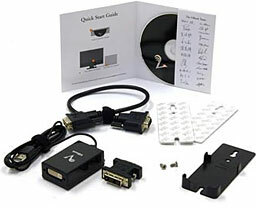 Supported video connectors: single Link DVI VGA (using DVI VGA cable) HDMI (HDMI adapter not supplied). Heat Sink: it keeps low the internal temperature. Low consumption: < 450 mA @ 5 V (as for USB specifications). VGA quality: improved thanks to quality components. PR: Other World Computing (OWC), announced today nearly 200 OWC and NewerTech brand external storage solutions, enclosure kits, and docking stations now offer the opportunity to purchase Drive Genius 2.1.1, the newest and latest version of ProSoft Engineering's best-selling disk utility, for as low as $25 - a savings of $74 off the retail price. "We're pleased to offer Mac users an incredible purchase value on what is widely recognized as the best disk utility available," said Larry O'Connor, CEO, Other World Computing. "With its comprehensive functionality controlled by an intuitive user interface, Drive Genius 2.1.1 is a natural choice to complement our high performance, high value storage lines." Drive Genius 2.1.1 is built upon the same award-winning platform that earned the utility numerous industry honors including Editor's Choice from MacLife Magazine, "Best in Show 2009" at iCreate UK, and daily use by Apple at the Genius Bar as part of the ProCare Yearly Tune Up. The utility removes hard drive bloat by maintaining, managing, optimizing, and repairing drives. Improvements to the latest version include updated speed/performance, defragmentation functionality, and Apple boot disk technology. An all-new user interface makes hard drive maintenance tasks painless, fast, and easy. Certain OWC and NewerTech storage solutions also include a $200 retail value utility software bundle consisting of ProSoft Engineering® Data Backup 3, Intech® SpeedTools Utilities™, NovaStor NovaBACKUP® and Carbon Copy Cloner. OWC and NewerTech storage solutions offer further value added features including all interface connecting cables for Plug and Play operation straight from the box, free lifetime US-based technical support, and industry leading warranty terms. PR: Freeridecoding announces BurnAgain FS 1.3, a free update of the CD/DVD multisession burning utility for Mac OS X. BurnAgain FS remounts a data CD or DVD in a writable way on the desktop just like a hard drive volume, making it possible to change the content of the media directly in the Finder. Files can be added, removed or edited several times and the changes can repeatedly be burned to the disk until the media is full. Since BurnAgain FS doesn't erase the disk each time, changing the content of the media is much faster than burning a new disk. The title of the disk can be changed prior to each burn. Without any additional software, disks burned with BurnAgain FS are readable on all platforms, automatically preserving special Mac file attributes. BurnAgain FS supports CD-R, CD-RW, DVD+RW, and DVD-RW disks. The update to 1.3 adds the option to erase RW media and improves the integration with the Mac OS X desktop. Opened disks are now always visible in the sidebar and on the desktop. The update also includes several minor bugfixes and is free for all BurnAgain FS users. A home single license is priced at $22. A FamilyPack option (5 installations) is available for only $48. Business licenses start from $32. Site licenses and educational discounts are available. A full-featured demo (20 trial burns) is available. PR: The New York Times and Adobe Systems Incorporated have launched Times Reader 2.0, an enhanced version of the digital newspaper reader with online/offline reading capabilities, powered by Adobe AIR software, a key component of the Adobe Flash Platform. Times Reader 2.0 is now available on any computer running Windows, Mac OS, or Linux operating systems. Times Reader 2.0 more closely mirrors the printed newspaper through improved navigation and functionality. "We are excited to release this enhanced version of Times Reader on Adobe AIR," said Robert Larson, vice president, digital production, The New York Times. "The Times is committed to developing innovative products to meet the needs and demands of our readers on whichever platform they choose. Times Reader 2.0 brings together the rich narrative of reading the print version with the benefits of online media such as integrated search, news updates and video journalism." "The new Times Reader on Adobe AIR provides a highly readable, engaging mix of The New York Times print and Web editions," said Michele Turner, vice president, product marketing for the Platform Business Unit at Adobe. "By leveraging the Flash Platform, using Adobe Flex Builder to create the application and deploying it on Adobe AIR, The New York Times is showcasing what is possible today with digital publishing, by delivering a branded Rich Internet Application (RIA) outside the browser that provides a closer, consistent connection to readers." Blends the best of the print and Web: parallels printed news with columns of high-quality text, combined with the dynamic flexibility of the Web, including search, links and up-to-the minute headlines. Enhances online/offline reading capabilities, allowing readers to sync content via WiFi and read synched content offline. Downloads the Latest News section every five minutes from NYTimes.com. Users can customize how often the Latest News is updated. Provides the latest videos from NYTimes.com. Allows readers to use the Browse mode to zoom out and view the visual overlay of New York Times articles, similar to browsing the print edition. Integrates interactive version of The New York Times premium crossword puzzle. Times Reader users will also enjoy the standard features available in previous versions, such as access to a seven-day article archive, the premium crossword puzzles and the News in Pictures. 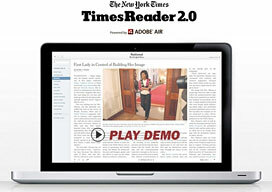 Times Reader 2.0 is available for $3.45 per week; it is free for New York Times home delivery subscribers. For a limited time, readers can try a free trial of four sections of Times Reader, which include Latest News, the Front Page, Business Day and the Most E-mailed List. For those who do not have Adobe AIR installed already, Adobe AIR will automatically download and install along with the Times Reader application. 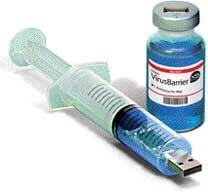 PR: Intego VirusBarrier X5 10.5.8 provides more detailed log information and other enhancements. Intego, the Macintosh security specialist, announced the release of VirusBarrier X5 10.5.8, an update to its acclaimed antivirus software that has garnered excellent reviews from the Mac press. VirusBarrier X5 is the only antivirus program that can scan files and applications on the iPhone and iPod touch in search of malware or files that indicate that exploits have compromised the devices. This version is a free upgrade for all users of VirusBarrier X5, and is available for download via NetUpdate, Intego s automatic update tool. PR: ProtectMac AntiVirus has been designed by security experts to keep you protected from today's computer threats. It utilizes the best in Mac technology to deliver a security solution that is both easy to install and easy to use. 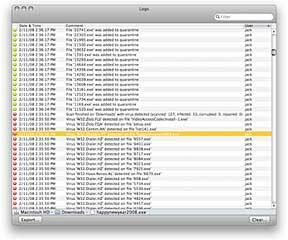 ProtectMac AntiVirus allows you to scan any area of your Mac or network for both Macintosh and Non-Macintosh malware. The user-friendly, graphical interface enables you to perform user scans, set up scheduled scans to run in the background, monitor status information and manage any threats that are discovered. ProtectMac AntiVirus automatically checks for updates daily, downloading new threat identities and product updates and installing them without user intervention or the need to restart your Mac. A single-user license covers individuals for up to 3 Macs and gives you free updates and free technical support for 12 months. ProtectMac AntiVirus supports Adaptive Intelligent Scanning (AIS). It learns which files and applications are important to you, ensuring that access to these 'hot' files is as quick as possible without compromising computer security. Scheduled scans now wake the computer if it is sleeping when they are due to run. Removing and editing scheduled scans has been made more reliable. The next scan time for scheduled scans is now calculated correctly when the computer sleeps.